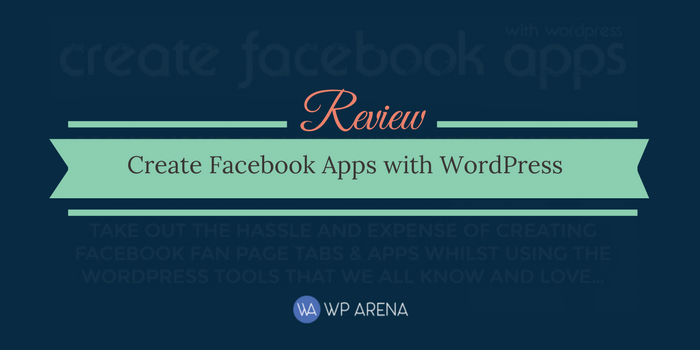 Just as the title of this review suggests, you can use now install and activate a plugin called “Create Facebook Apps with WordPress” and just as the name of the plugin suggests, you can use this plugin to create a Facebook app centered around your website. Isn’t it an amazing concept? The possibilities are endless and it presents you with a brilliant way to integrate your website into an app that will definitely spark interest in a number of people. You can link your website to Facebook in a creative and innovative way without having to consume too much of your time or hire an app developer to complete the complicated side for that matter. What kind of Apps can be made with this Plugin? Say you want to hold a sweepstakes giveaway for the products on your website or your band’s merchandise. You can advertise the sweepstakes on your website; however, there would be no guarantee as to how many people get to see your post and how many decide to participate. The best way to advertise your sweepstakes while also creating an effective way to grab more attention is to use a Facebook app custom-made for your website. A Facebook app will allow you to get in touch with many more people and show them the best of your website. It is a foolproof way to attract more people while also getting them to use your app. The advantages of using this plugin are endless and the best part is that you do not need to know anything about app development to make effective use of this app. Before the creation of this plugin, making a Facebook app centered around your website would have been a very difficult task and the Facebook page tab that could be made would have been very limited in a lot of aspects. However, once this plugin was created, WordPress users with a self-hosted WordPress system have found it increasingly useful and an amazing way to gain exposure for their brand. You can even create apps which integrate other social media platforms, like Instagram and Twitter. Does it seem too amazing to believe? If so, then install the plugin today and reap its benefits. You will be astonished as to the smoothness with which you can use a modern method for branding. Integrated with Google Analytics to measure the traffic volume and success of your apps. This plugin also solves the common yet frustrating mobile issues with Facebook apps and now makes it possible to share the app to users of all devices & screens. Signification cost savings when compared to 3rd party cloud-based app services that do less than what this plugin does. The list of features goes on, but the most interesting feature is that this plugin is pretty easy to use. You can make effective use of it even if you are a WordPress newbie. The documentation will help you along the way and you will love how simple the steps are. If you want to Create Facebook Apps with WordPress as a way to get your brand the exposure it needs or for any other reason, this plugin is the way for you to go. It will give you an amazing experience when building your app and it provides you with a number of different features that will help in ensuring that you have efficiently used this plugin. A huge plus point is that you can customize the app whichever way you would like. This customization will help you bring a personal touch to the app and this will get people more curious as to what your app is and what the website behind the app is like. Facebook is a brilliant social media platform from which you can generate more interest for your website. While creating an app for your website is effective, you should ensure that you have customized the app enough that your app users can see that your brand is behind its creation. You need to portray your brand and place it in the limelight when it comes to the apps you create through this plugin, otherwise, there won’t be much use. Conclusively, this plugin is a great way to present your brand and website to a wider audience. It is packed with features that will help you make your apps representative of your website. Thus, for anyone in need of a new and creative way to get attention for their website, the Create Facebook Apps with WordPress plugin is the best way to do so. QuadMenu Review – The Best Multipurpose WordPress Menu Plugin?